VIEWS, VIEWS and more VIEWS of the Shenandoah River and Kennedy’s Peak located across the river in the George Washington National Forest. 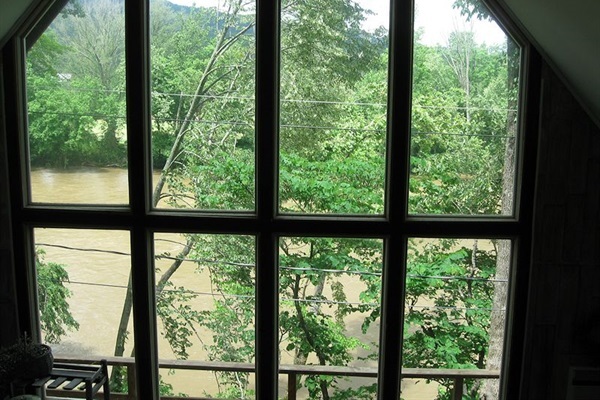 The Siesta River Cabin is located directly on the Shenandoah River and has private steps down to the river. This river front cabin is a chalet-style cabin featuring all glass on the front and outstanding river and mountain views from floor to ceiling. Wonderful cabin for swimming and fishing. The wrap around deck offers a wonderful spot to enjoy nature in a tranquil peaceful setting. Enjoy having an outside breakfast in the morning, a cool drink in the afternoon, or a BBQ in the evening, all while watching the stunning sunsets. Star gazing from the 7 person hot tub is a favorite and on those cool fall nights, snuggling up by the beautiful fireplace is the optimum of romance. Imagine lying in a queen size bed in the loft . . . now just open your eyes and see gorgeous views of the river and mountains. Enjoy the winter wonderland while watching the snow fall as you snuggle up by a warm and cozy fire. Any season is the perfect season to enjoy our Siesta River Cabin. If you'd like more info about this cabin or our other cabins, check out our website: http://river-cabins.com. No additional guests are permitted at any time in cabins without permission from owners. No more than 2 dogs are permitted in the cabins. Cabin guests are required to leave the cabins in good condition. Cancellation between 30 days out and 10 days out from arrival. There is a $35.00 cancellation charge. We will try to rebook the cabin. If we are able to book, you will receive money back less a $35.00 cancellation fee. There is no guarantee for rebooking and if not, money is forfeited, however usually not a problem.